The Samsung PWR-24AC-50VA-UL is an step down transformer having LED indicator that supervises power. Power center engineered to manage remote camera and has 24VAC with 3Amp supply current. It has single mode protection from hot to neutral. The Samsung PWR-24AC-50VA-UL has many exciting features for users of all types. You can extend the lifetime of your Samsung PWR-24AC-50VA-UL with the purchase of a FactoryOutletStore Factory Protection Plan. See the Samsung PWR-24AC-50VA-UL gallery images above for more product views. 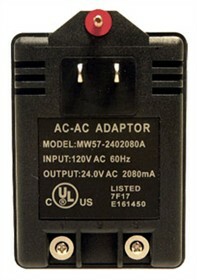 The Samsung PWR-24AC-50VA-UL is sold as a Brand New Unopened Item.